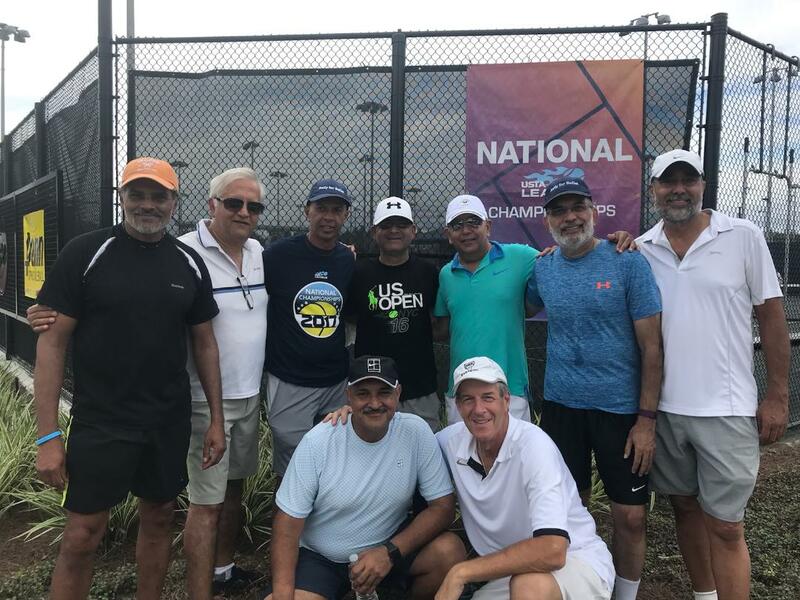 I have been playing in the USTA tennis leagues since I was 18, but it took me 33 years to finally reach my first national tournament: the Men’s 55s 9.0 which took place in Tuscan, Arizona in 2009. A few years later, in 2015, I made it to my second National Tournament: the men’s 55s 9.0 in Surprise, Arizona. I am now 59, and something special happened to me in 2017. I made it to four national tournaments with four different teams, in four different divisions. I experienced different emotions playing in each national tournament. The first National Tournament I made was the 40s 4.5+ in October, competing with the team captained by Andrew Ross out of Sportime Syosset. We played in a park venue in Mobile, Alabama. About half of the team had been to a national tournament before so they had experience, and we planned dinners, practices and enjoyed walking around the city of Mobile. I told the players that have not experienced nationals before to enjoy each moment because getting to the National’s is very special and perhaps a once in a lifetime achievement. Just over a week later I headed down to Orlando, Florida for the Men’s 55s 8.0 Nationals. I played with the Sportime Syosset team captained by Raj Nagdev, and the venue we played out was much different than the Alabama park. It was the USTA National Campus; it was bold and powerful, and we compted on Har-Tru courts. It had 100 courts and all the technology to go with it as well as three cafes, cell phone charging stations and a great locker room. It was a special place to play tennis!!! This tournament was the most special to me because I got here with a team of great guys with big hearts. My teammates worked extremely hard and really appreciated the opportunity to play at Nationals. Since I was the most seasoned player on the team, the captain asked me to give a pep talk before each match. The team asked me to share everything I knew about playing and preparing for a national tournament. My advice that I shared was play hard, go for everything and, most of all, enjoy the experience! By the third Nationals, I was much more relaxed because I knew what to expect. 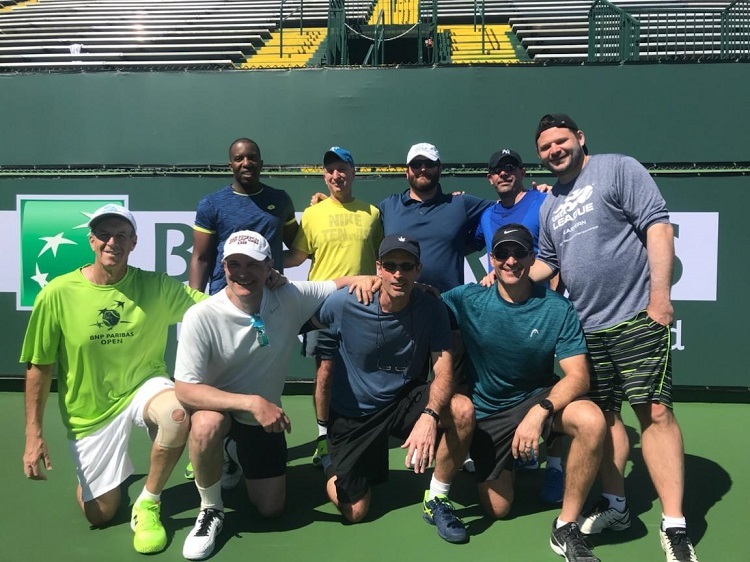 Competing out of Armonk Tennis Club with the team captained by John Hoffman, I went back to Orlando and really enjoyed the camaraderie amongst my teammates. I also loved being able to share my experiences with tennis players all over the country, and we ended up reaching the semifinal round! The final Nationals that I was able to reach was in Indian Wells, Calif this past March, playing with Ian Schapiro’s team out of Sportime Syosset. We had the privilege of playing on the outside courts alongside the pros at the BNP Paribas Open; it reminded me of the U.S. Open with the 24/7 tennis atmosphere. When you weren’t playing tennis, you were watching the pros! Tennis has been a great sport for me. I knew 50 years ago that I would be able to play forever and meet new and exciting people along the way. You can play tennis anywhere; all you need is a tennis racquet and the will to meet new people. I also want to thank my wife Beth for her support and traveling with me to each tournament. For me, tennis is the sport of a lifetime! Wyn Mintz was born in 1958 and grew up in Bethpage New York. He would spend his Sundays playing tennis. His father taught him the continental grip and he played with a wood racquet growing up. He would go on to play for the Island Trees High School Varsity Tennis Team and after that, began to play in USTA leagues where he experienced the camaraderie and competition of team tennis. He has been married for 33 years to his wife Beth and they have two boys.